Clement Marine Constructions are experts in the design and manufacture of pontoons ranging from 450t concrete pontoons as installed at Circular Quay for RMS to our small ‘Landmark’ fully moulded pontoon used in domestic applications. Our core business includes specialised boat ramp pontoons and facilities which allow for ease of access for all boat users. 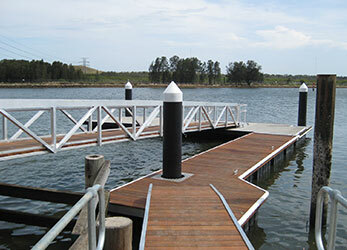 We have provided over a dozen pontoons for the better boating program and many of the facilities upgraded by local councils recently include pontoons supplied and installed by Clement Marine Constructions. Pontoon supply compliments our ability to provide a one stop shop and we can provide clients with the solution they are looking for.